The Ft. Lauderdale International Boat Show is the place to present pristine boats both new and previously owned from all over the world. When a bevy of yachts dock in close proximity to one another, it is easy to tell which ones stand out with a sparkling presence. Professionally cleaned windows make a huge difference between the boats that sell and those that do not. Salt is a major culprit to your yacht’s windows. This is because salt crystals form when salt dries. With a fine sand consistency, crystals scratch glass windows like sandpaper. If left on glass long enough, it can cause permanent damage. It takes time to clean boat windows. Matter of fact, it can take 30 minutes or longer to effectively clean them the right way. Professionals have time to implement the proper steps to ensure investors, buyers and other boat owners—even your competitors—notice a job well done. Detergents and strong abrasives scratch windows. The wrong chemicals make glass, vinyl, and plastic windows, in particular, to look cloudy and become brittle. What’s more, manufactured windows differ in design and maintenance recommendations. Plastic windows especially must have special treatment and require regular cleaning. Unfortunately, silicones and alcohol are chemicals found in common glass cleaners cause irreversible marring. This poses a challenge for do-it-yourselfers. Professional window cleaning reduces the risk, eliminates guesswork, and gets results. In humid weather, salt draws water out of the air. At night, salt mixes with dew and turn into saltwater. So we know that salt causes havoc to windows, but the dew point plays an important part in how windows look too. When air is full of water vapor, water droplets form called condensation. This also forms on windows. Window washing experts use best practices along with industry recommended materials to wipe away morning dew from your windows. They have tips to share in preparation for your boat shows and family fun excursions. Mold is the circular brown, yellow, white, gray, black or blue furry fungus spores that develop on or nearby windows, and along window hatches. Mold forms where dirt stays. We know mold forms in warm humid weather, it is also true that mold forms in cold weather. Mold accumulation causes fatigue, allergic reactions, and respiratory problems in humans. Since excess moisture contributes to mold formation, effective window cleaning is vital for the maintenance of your windows at the very least. It is extremely important to follow through with drying windows completely. It is typical for the average boat owner to wash their boat’s windows at the same time as washing down the rest of the boat. by doing that, debris could splash everywhere. For example, if you use a high-pressure hose nozzle to power off the salt on the cockpit deck, it could get into the engine compartment and cause rust. Expert window cleaners use a different method on the hatches than on the windows themselves. They lower the stream to the right intensity to clear all debris from that area. Here’s an easy solution: Bypass the trial and error phase of learning specific techniques that take up your time. Select a window washing provider skilled in the cleaning care for your type of boat windows. Washing windows is a time-consuming task and it takes away from other preparations needed to get your boat ready for showing. From a safety standpoint, as you clean, you must be careful to wipe spills, otherwise, someone might suffer an injury from a fall after slipping on a patch of water. Leave it to the experts. Meticulous window washing and drying is what professional yacht window washers do daily. Make safety a top priority and hire the best yacht window-cleaning specialists. What the windows look like on the outside gets prospects attention. Everyone gravitates to boats that have sparkling windows. They beckon them to come inside and look. When potential buyers walk inside, they want to see the clear blue ocean as if there were no windows at all. Clean windows are your advertising campaign for your yacht. This is factual whether your boat’s windows are made of glass, plastic, vinyl, or a polyester composite, acrylic, or polycarbonate. How you take care of your boat, no matter how small or large says a lot about the owner. Clean windows make the statement that you care. 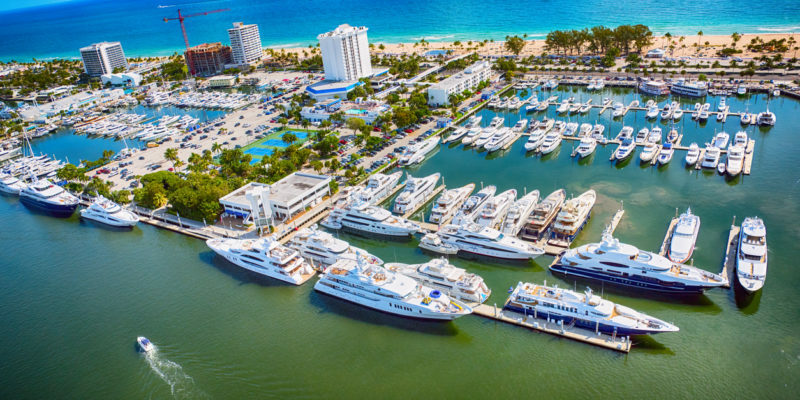 Utilize a yacht window cleaning service provider and get your yacht show-ready for this year’s Ft. Lauderdale International Boat Show. The investment will pay off because buyers are more willing to purchase boats that look new rather than soiled. Windows that are professionally cleaned make all the difference. Contact us today and display your boat in style at the show. Call now. The window-cleaning industry is divided into two categories: ground work and suspension work. High-rise window cleaning involves buildings over four-stories tall. Workers are suspended from the top of the building or work from elevated scaffolding erected on the exterior of the building. Depending on the nature of the operation, workers can be faced with various safety hazards. Safety must be paramount for high-rise window cleaners, as any accident that happens several stories off the ground will have catastrophic consequences. The responsibility of ensuring the safety of the window cleaners rests with all parties involved in the window cleaning operation. This includes the contractor, the workers and the building manager. Like most dangerous jobs, high rise window cleaning requires comprehensive training. Workers must have a comprehensive knowledge of what equipment to use, understand the safety features of the equipment and how to use it effectively. Additionally, workers must be highly skilled and comfortable at working at heights. Due to the extreme height of buildings, with many over 50 stories high, workers must be checked for any medical conditions that could possibly interfere with their work performance. Conditions that could affect performance, and safety, when working at extreme height include balance issues, epilepsy, high or low blood pressure, diabetes and impaired limb function. Workers must wear a safety harness around their chest or chest & legs that is connected to both a working and safety line. These ropes are typically adjacent to one another. A backup safety-line adjustment device prevents a fall if a worker slips, loses control or the main working harness line fails. A “descender” allows the worker to get down safely by gently lowering the worker to the ground in case of a slip or fall. Safety anchors should be connected to the sides of the buildings before cleaning building windows. Anchors typically will have been tested for a safety rating load of 1,000 pounds. The safety and main lines typically go through eye holes in the anchor and are designed to help prevent accidents if a bolt comes loose. Anchors are tested at least once every year. Weather: Weather conditions must be constantly monitored during any active window-cleaning operations. Professional high-rise window cleaning requires workers to be outside in various weather conditions. As such, inclement weather conditions that include extreme hot and cold temperatures, precipitation, lightning and wind conditions are all taken into account. Due consideration has to be given whenever a wind speed of 15 miles per hour or greater is present. Exterior high rise window cleaning should not take place whenever there are sustained wind speeds in excess of 25 miles per hour. Personal Protective Gear: Window cleaners can be exposed to a variety of chemical-cleaning products. They must wear appropriate protective gear, such as gloves, eye protection and possibly respirators, depending on what chemicals are being used on a particular job. A helmet helps protect the workers head from injury in the event of a fall as well as from objects that may fall from above the work area. Appropriate work boots with steel toes protect worker’s feet from slipping, chemical exposures and impacts. High-visibility clothing allows others to readily notice the workers. Tripping and Falling Hazards: Falls are the primary hazard faced by commercial window cleaners and crews working on high-rise buildings face increased fall hazards. The greatest fall hazard exists when working on surfaces without adequate edge protection. Edge protection includes a guardrail or a structural parapet a minimum of 42 inches high. Changes in elevation of work surfaces greater than four feet that are not protected by a structure 42 inches or taller, such as a guardrail, can pose tripping hazards. Tripping hazards can include, but are not limited to, scaffolding and skylights and dissimilar roof heights, balconies and unprotected holes and retaining walls on the ground. Cleaners can reach away from their body to clean a window, provided only their upper body is extended past the edge of the structure they are standing on and both feet are set firmly on said structure. Body weight should never be supported by a window or window frame when reaching out to clean. Ladders: Job-site conditions may dictate the need for ladders. Crews must use the appropriate type of ladder, such as an extension vs. a step ladder, for the appropriate conditions. Electrical: Workers must be constantly aware of electrical hazards to avoid shock or electrocution. This requires maintaining a minimum 10-foot distance from all exposed outlets, electrical fixtures, power and supply lines in the work area. Ladders, water-fed and extension poles shouldn’t be extended to a height to allow these devices to come within 10 feet of power lines or power supply devices. People: Others, such as building occupants, co-workers and members of the public, will usually be present during most types of high-rise window cleaning work. Crews must be aware of their presence to both protect themselves as well as anyone else that may be in the work area and impact safety. Emergency Situations: At least one person on an active job site should have full training in basic first aid. All entryways and exits must be identified and an emergency evacuation plan must be in place. An emergency plan must be in place whenever working in earthquake-prone areas. Bodily-Injury Coverage: A component of general-liability insurance, bodily injury insurance will cover members of the public or building workers who are injured during window-cleaning operations. Bodily-injury insurance will cover their medical and related expenses. Property Damage: This covers damage to a customer’s property cause by window washers. Completed Operations Coverage: This insurance covers liability if someone is harmed by a product or services that has been rendered. For example, if a worker used a cleaning solution that scratched the windows the owner could sue for damages. Workers Compensation: This is standard coverage that will pay for any necessary medical care and associated costs and expenses if an employee is injured on the job. In Conclusion, a high-rise window cleaning company should take all the necessary precautions to have their employees safe. 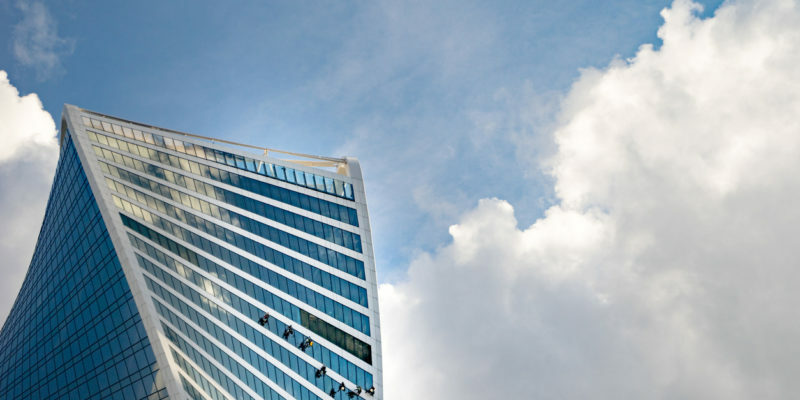 Here at Window Cleaning Miami, we are licensed and certified high-rise window cleaners. Trust us to complete jobs on time and in a safe manner. Call us today! Cleaning glass windows is the most tiresome chore and why many people avoid it. It is also the most challenging to master. Clean your windows wrong and you end up with smudges or streaks. However, doing it right can help brighten up a room. Sadly, the battle is often lost before it can begin just based on the type of cleaning material you use. We’ve all heard the old wives’ tail: newspaper used in home window cleaning. There are some that use newspaper in window cleaning for offices! But is it true? Let’s weigh in on the pros and cons of using newspaper for clean glass windows. If you want to live as frugal as possible or to tuck a few bucks away for a rainy day, the cost of newspaper is minimal at best. In many cases, if you know where to look, you can get your hands on it for no more than the time it takes to pick it up. Many places recycle newspaper and would be more than happy for you take a few bundles off their hands. The worse feeling is when you head to the store only to find the item you needed is sold out. Newspaper is so readily available that you’re guaranteed to pick up a good stack in one trip. No special trips to a specific store, no ordering online or waiting on a shipment. If you use newspaper for window cleaning in offices, chances are you’ll find bulk newspaper just lying around near recycling bins by the dozens. Interestingly, window cleaning contractors believe that the ink on newspaper can help scrub away dust, dirt and small stains without harming the glass. The ink gives texture and can act like gentle sandpaper without scratching the glass. You won’t be able to get the same result with regular wash clothes or paper towels. 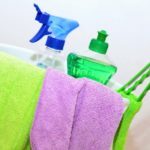 If you’ve spent time doing home window cleaning or window cleaning for offices, then you are well aware that using paper towels or clothes often leaves a streak behind. Also, depending on the brand, you might find lint left behind that requires another wipe down. It almost becomes an endless cycle leaving you with spotty, streaky glass to look at. Newspaper doesn’t have that problem. Most times just a bit of wiping and your glass is clear and lint-free! Unlike clothes that require rewashing, newspaper can go right into the trash or—better yet—go into the recycling bin. So you can say goodbye to your rag washing days and save yourself some room in your washing machine. Not to mention saving on laundry detergent, electricity and dryer sheets. While newspaper is in abundance, you’ll need to keep a good stack if you plan to do all the windows in your home or office. When using cloth to clean a window, you have the option of rinsing and reusing. Unfortunately, newspaper does not have the same ability. Once newspaper is wet it will begin to break down and fall apart. Many times when you use newspaper to wash glass, you will notice some black (or perhaps other color) smudges appearing on your fingers or under your nails. As the newspaper starts to dissolve, some of the ink will begin to transfer to your hands. While the ink will not appear on the glass, it will appear on your skin. Often times the ink will remain on your skin for a few days or more. 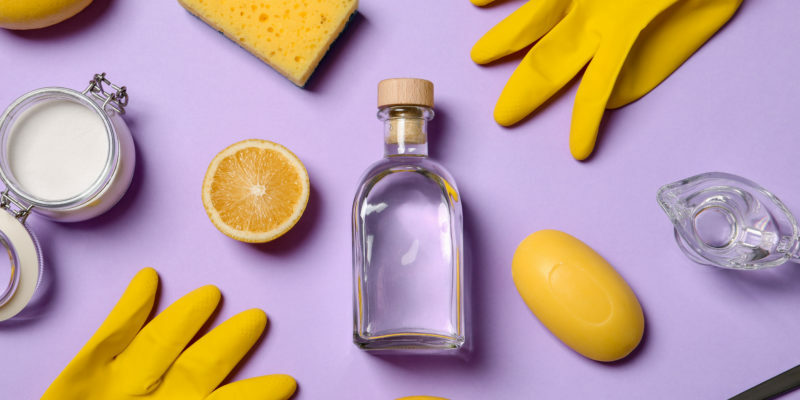 Some people have claimed luck with using rubbing alcohol to clean your hands, but this can leave your hands feeling dry. Fortunately, this con can be avoided by using rubber gloves while washing windows. However, be sure to watch for wooden frames since ink will stick to window frames and is not easy to remove. Ultimately, the use of newspaper to clear home or office windows will depend on you. You might want to consider the kind of windows you’ll be working on and the number of windows that need washing. If you still find yourself on the fence with your decision, newspaper is so easy to come by so it doesn’t hurt to give it a try. Comparing the two results and seeing if newspaper provides you with the results you want costs nothing more than your time.